Home › Blog › Collars, Leads and Harnesses: Which is Best for My Pet? Going out for a nice brisk walk with your pooch is one of the great joys of pet ownership. But, it can turn into a battle if you don’t have the right equipment. 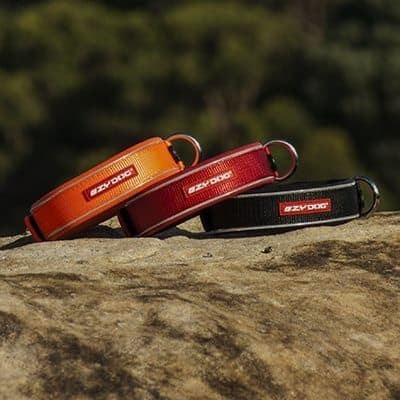 A tough, stylish and durable collar is an important purchase, and having the correct lead can make a huge difference to the enjoyment and safety of the walk for both you and your dog. A collar is absolutely essential for your dog. 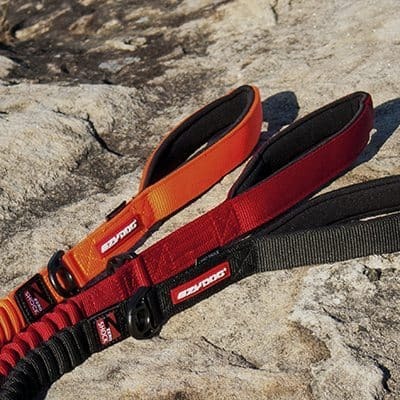 There are a wide range of collars available, from traditional nylon and leather to those used for specific training purposes. 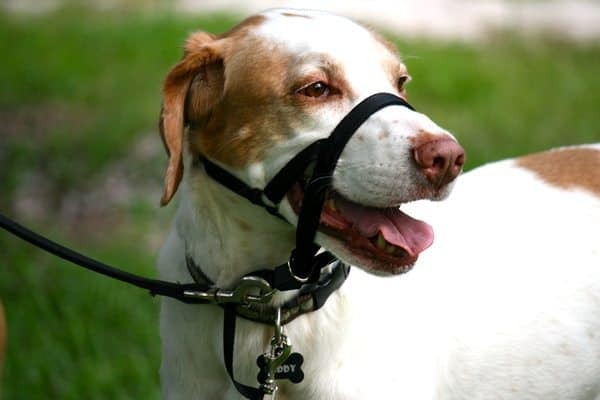 If you walk your pet with a collar and lead rather than a harness, perhaps consider a collar that will not come undone with excessive pulling like the durable EzyDog Double Up Collar. The type of clasp is important: metal can rust and the smaller plastic clips can break. Consider spending a bit more to get proper stainless steel and secure clasps. A collar should be snug enough not to come off over the head, but you should be able to fit 3 fingers underneath. As a general rule, try to choose a wider collar so that if your dog lunges against the leash, the force applied by the collar against the dog’s trachea is spread over a larger area. You might also want to read our tips on training your dog and preventing lunging. Also think about your dog’s daily activities, for example, if your dog likes to swim regularly then a leather collar is not ideal. If your dog does swim, we like the EzyDog Neo Classic, made of neoprene so that it repels water. This style is safe to leave on even when your dog gets wet. For a fabulous fashion statement collar, check out the hypoallergenic, environmentally conscious Hamish McBeth range for some unique head-turning pet accessories. An ID tag should be easy to read and the engraving should be durable so that continual rubbing is not going to fade the print. Plastic tags can be a little fragile for adventurous pets, but a stainless steel tag should last for a lifetime. Having a mobile number on the tag is ideal, as you need something that can always be contacted. If you also include your address or the name of your Vet, if your pet is found roaming the finder has somewhere to take your dog. Impounding fees can be expensive and if your pet is taken to a shelter over holidays or long weekends, they may end up locked up for longer than you would like. If your dog is unlikely to allow someone to read their tag, there is also the option of a personalised pet collar that allows you to have your phone number stitched on, so it can be read from a distance. 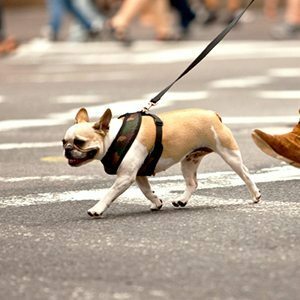 If your dog is very boisterous and energetic or frequently lunges against the leash, a harness will be safer and more comfortable when walking. Collars can cause significant trauma to the vital structures in the neck for dogs that pull. 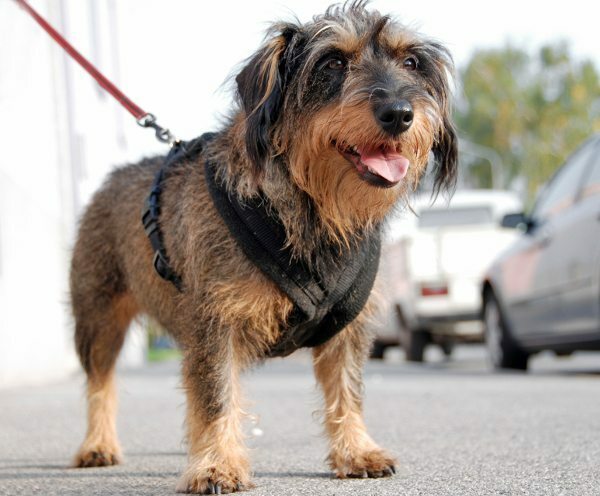 Harnesses are also much more secure for dogs that have a tendency to slip their collars. A front-clip harness gives you much more control, as most harnesses that attach behind the shoulder blades actually allow your dog to pull with his entire body-weight, similar to a pulling a sled. This can be particularly bad if you have a strong dog or shoulder issues. With a front attachment point your dog soon learns that if he pulls ahead it is very difficult to walk in a straight line, and walking by your side is much easier. Harnesses are also recommended for very small dogs because their tracheas can easily be damaged when they pull against a collar, which is why they will often cough. Dogs that have flat faces and shallow eye sockets are also at risk of eye damage when pulling on a collar or choke chain. If you regularly take your dog in the car, many harnesses have an additional loop that allows you to thread through the seat-belt. It is a legal requirement to have your pet restrained while travelling in a car and this ensures the safety of your pet should you brake suddenly. These are both head halters, similar to what you would use to lead a horse. The lead attaches under the chin, so when your dog pulls ahead, their head turns back towards you. Think about how much control a horse owner has when leading a much larger animal and you will see how this could work for you. These are a great short-cut to getting your dog to heel and to listen to directions. The first time you use one your dog will most likely try to get the head collar off, but give lots of treats, associate it with going for a walk and your dog will soon adjust. View this instructional video on how the Gentle Leader works. Head harnesses are such a great way to get back control on a walk with a larger, stronger dog and again are excellent for people with shoulder injuries or for those with dogs that can be a little unpredictable on a walk. Collars that aim to use punishment to train are ineffective, add to stress and anxiety and are unnecessary. Trainers that advocate these types of methods are using outdated methods and research has conclusively shown that punishment is highly stressful for the dog and is therefore ultimately detrimental for their training. If your dog is barking, there are many ways to curb this nuisance behavior that are much cheaper and more effective than a shock or citronella collar. These collars are also particularly unreliable and most will eventually learn to bark despite them. Choke chains are very traumatic to the delicate veins and nerves in the neck, increase pressure in the eyes and really do little to stop your dog pulling until you are actually choking your dog (which is why they are called ‘choke chains’). They should never be left on your dog when unattended due to the risk of accidental strangulation. Appropriate use of a choker chain involves having the collar slack and using the sharp ‘check’ noise of the chain as a correction, not the actual choking method which most employ. If your dog is trained enough that the choke chain is always in the relaxed, loose position, there is really no need to use it. These allow your dog free reign, while still giving you some control. They are not suitable for larger dogs, as the thin rope can often snap. They can also be a little fiddly to keep in the ‘locked’ position if you regularly need your dog to stay close (for example, when you stop to cross the road). If you have two dogs, consider a double leash that will allow you to walk both dogs at once. We love the EzyDog Vario 6 multi-function leash. If you run, ride or walk long distances with your dog, a hands free leash can be clipped to your belt or looped over your shoulder. The EzyDog Vario 6 has the versatility of this feature. A great option for dogs that pull is the Zero Shock leash from EzyDog. This includes a bungee section that absorbs shock, sending it back out to your dog rather than up your arm. This really can save you from shoulder injuries when walking a larger, strong dog. Whenever you go out and about, don’t forget your doggy bags. Look for a leash that has an attachment point for a little satchel, where you can store your doggy bags and treats. Having treats with you at all times allows you to reward good behavior. You also have a way of getting your dog’s attention and rewarding your dog for coming back when off-leash. If your dog is a little wary of strangers, is under training, is scared or aggressive with other dogs or needs to be approached with caution, you need to know about the Yellow Dog Project. Tying a yellow ribbon to your dog’s collar or lead, or putting a yellow bandanna or coat on will remind others that your dog should be given a wide berth. These are very useful for dogs that are inclined to snap at strangers. We hope this guide has helped you decide which basic equipment you need to walk your dog safely and identify your dog. Buying good quality products ensures longevity and durability. For something that is used daily it is worth spending a little more for something that will last and reflect your personality and lifestyle. The post Collars, Leads and Harnesses: Which is Best for My Pet? appeared first on VetBabble.